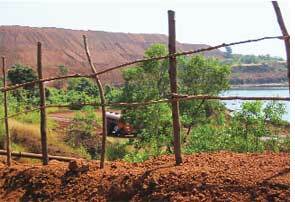 THE National Environment Appellate Authority last month dismissed an appeal that had challenged environmental clearance to a high-grade iron ore plant in Sanguem taluka in Goa. In September 2008, Sushant Naik, a Sanguem resident, had filed the appeal and alleged discrepancies in the environmental impact assessment report of the project and claimed that the project promoter had misrepresented facts to get clearance from the Union environment ministry (see 'Legal tussle', Down To Earth, January 16-31, 2009). Although the authority admitted there were discrepancies, it junked the appeal as devoid of merit. It has justified the problems as typographical errors, with an advice to the environment ministry to be more careful the next time. In the appeal, Naik pointed out that while the facility was coming up at the border of two villages, Santona and Dudhal, the minutes of the expert appraisal committee (eac) under the environment ministry had mentioned the village as Shiroda. (Initially, the facility was proposed at Shiroda; it was later shifted near Santona.) Second, the appeal alleged that public hearing and eia was conducted for the site at Shiroda; third, the Kaley river was barely 50 metres from the project site whereas the eia said it was 10 km away and fourth, the gram sabha of Santona village had passed a resolution against the proposed project. Mandovi Pellets, the promoter of the iron ore project, rubbished these claims. It said though the minutes of the eac meeting referred to Shiroda; the final clearance by the ministry was accorded to the Santona and Dudhal site. "The mention of Shiroda is a typographical error," the company said. It said the mention of 10 km distance of Kaley river was also a typo error. It seems the appellate authority bought the company's version. "The Authority has perused relevant documents and is convinced the eia, the public hearing and the consideration of the project by the eac was for Santona and Dudhal only. Mention of Shiroda in the subject of 81st eac meeting was merely a typographical error which did not make a material difference," its order read. It also added that as per the eia notification of 2006, a no-objection certificate from the panchayat was not mandatory. This is not the first time the authority dismissed an appeal citing typo errors. An appeal filed by Raigad-based Shetkari Sangharsh Samiti against the proposed 4,000 MW thermal power plant was dismissed on the same grounds in February this year (see 'Sorry it was a typo', Down To Earth, December 16-31, 2008).